Ahead of the festival, Themar residents voiced growing concerns over the concert, displaying banners reading: “All these Nazis are insane, they must have potato brains” and “Your voice against Nazis.” But local authorities said they could not prevent the festival from taking place, as it was not illegal under German law. The right-wing extremist volunteer Azov Battalion is gaining more and more support in Germany, according to Spiegel. Their “advertising campaign” has apparently been successful, the magazine says, noting that social media networks increasingly display photos of German neo-Nazis who proudly show off their allegiance to Azov. 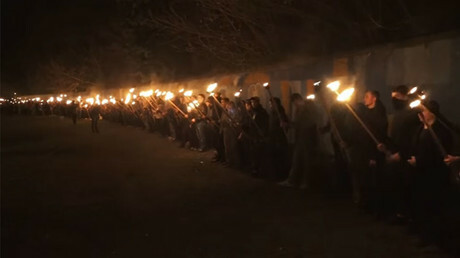 Although Ukrainian Interior Minister Arsen Avakov sought to include the Azov Battalion in a training program run by US Army units in western Ukraine, in 2015 the US House of Representatives unanimously adopted legislation outlawing the training and arming of the group. It referred to the battalion as “openly neo-Nazi” and “fascist,” and prohibited US instructors from training or arming them. Foreign Ministry spokesman Aleksandr Lukashevich said that the next “logical step” for US lawmakers would be to finally recognize that the 2014 coup in Kiev, which was “actively supported by Washington, was staged by the same neo-Nazi thugs. Obviously, other units of Ukraine’s National Guard are no better than ‘Azov,’” he added. 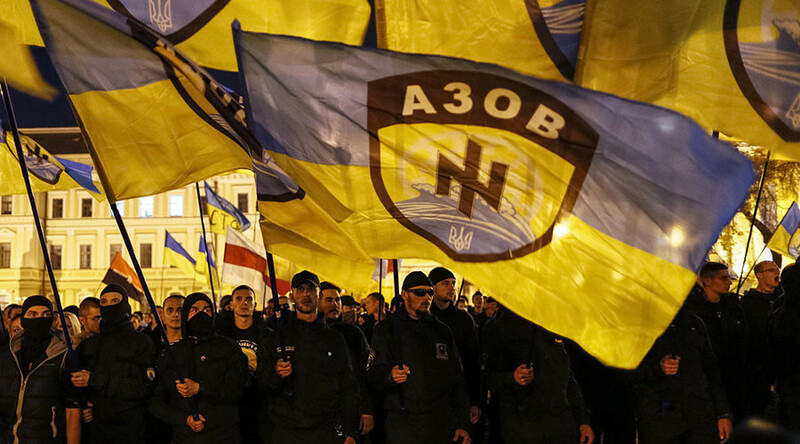 Azov is easily recognizable by its use of the Wolfsangel (Wolf’s Hook), an ancient symbol that was also used during WWII by Nazi SS divisions and fellow Dutch Nazi sympathizers. 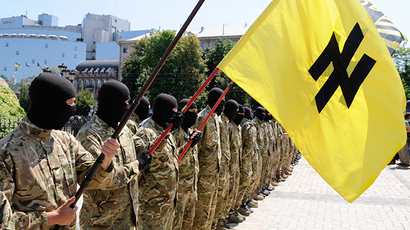 Azov’s emblem also includes the Black Sun symbol of the SS.